On 30.08. BeMo celebrated the laying of the cornerstone of extension of logistic center Groß-Rohrheim. Among the attendees was the major of Groß-Rohrheim. We wish all the best to everyone involved! On february 27th the coorporation of JV Bechtel – EllisDon with help of BeMo broke through the first tube of Quarters tunnel, part of the Edmonton Valley Line. Last week BeMo received the VDBUM award 2018 in the category "Innovation in practise" with our „Uphill Excavator“. Congratulations to everyone involved in this innovation! A few days ago the northern tube of tunnel Herrschaftsbuck got broken through after only six months of work. Among the attendees was district president Bärbel Schäfer. We congratulate everyone involved and wish for further accident free works! On december 1st the 24,7 km long freight train bypass with its 3,5 km long centerpiece tunnel Pummersdorf got inaugurated. Among the attendants where governor of lower Austria, Johanna Mikl-Leitner and ÖBB chairman Andreas Matthä. Congratulations to everyone involved in this great achievment and thank all BeMo staff for their commitment! A short video about project Crossrail in London, run this week at Servus TV, a local austrian television broadcasting station. On Tuesday 10th October 2017 the second one-rail tube in Cannstatt got broken through. Among the attendants was Manfred Leger, managing director of DB Project Stuttgart - Ulm GmbH. We congratulate everyone involved in the project and wish for further accident free works! On friday 29.09.2019 tunnel Arlberg got reopened for traffic after 3 years of work. Among the attendants where boths governors from Tirol and Vorarlberg, Günther Platter and Markus Wallner. Further information and pictures can be found here. An interesting article about works at tunnel Herrschaftsbuck. As part of the BBMV-JV (Crossrail, Lot C510) BeMo won first place at the TechFest Awards 2017 by New Civil Engineer (NCE) in London in category „Best Use of Technology: Health & Safety“. On September 9th both tubes of tunnelchain Klaus where opened after three years of work. Attendant where minister Alois Stöger, governor Thomas Stelzer and ASFINAG director Alois Schedl. We want to thank everyone involved in this project for their commitment and congratulate for a successful and on-time handover to the client. At 27th july 2017 the first cutting at Tunnel Herrschaftsbuck got celebrated in presence of district president Bärbel Schäfer, minister of transport Winfried Hermann and state secretary Norbert Barthle. All the best to everyone involved in the project and accident free works! More information and pictures can be found here and here. Our department Ground Engineering received three additional Projects in june 2017 in Berlin: beside the extension of works at ARGE "Rieck 1" consisting of PST Grundbau and BeMo to further construct "Rieck 2" we also received order to build two excavation pits at Berlin Central Station in the course of work at Grand Central Berlin. Both contracts consist of diaphragm walls with ancors, horizontal timber sheeting and cut off trenches, grout jetting and various other works. We wish everyone involved a safe and sucessful start! Some interesting pictures about the first cutting at Tunnel Spitzenberg can be found here. Two interesting articles about City Tunnel Karlsruhe can be found here and here. Our department for ground engineering works received another project recently: BeMo got commissioned with the excavation of a pit for the upcomming office building "Rieck 1" by CA Immo directly in front of the central railway station in Berlin. Work will get carried out together with PST Grundbau GmbH and consists of steel piling walls, grouted ancors and a jet grouted sole. All the best to everyone involved and Glück Auf! We gladly announce our first order for building a bridge: DEGES ("Deutsche Einheit Fernstraßenplanungs- und bau GmbH") commissioned us with the construction of a replacement for the existing bridge Volmarstein in Nordrhein-Westfalen. Work will be done in cooperation with our mother company Metrostav a.s., division 4. The value of the projects adds up to round 17,5 Mio. € net. We wish everyone involved a good start and successful project! An interesting article about us and our projects can be found online at the Wirtschaftsforum. Yesterday a tunnel inset celebration was held at Tunnel Wendelberg in presence of Dr. Peter Ramsauer (former secretary of transport). All the best to our team and safe works! Our Department Tunnelling Germany received another project commision from the Regional Commision Freiburg. We where assigned with the construction of Tunnel Herrschaftsbuck. Work will be done in partnership with our sister company Subterra a.s.
We wish all to best to everyone involved, Glück Auf! We're glad to announce that we received another project commision from the Deutschen Einheit Fernstraßenplanungs- und bau GmbH (DEGES). We where assigned with the construction of Tunnel Zierenberg on the A44. Construction will be done in cooperation with our sister company Subterra a.s. and our long term partner Stutz GmbH. On monday 19.12.2016 section 3b of tunnel Bad Cannstatt, part of the Stuttgart 21 project, got broken through. Among the attendees where Dr. Rüdiger Grube, chairman of the Deutsche Bahn AG, as well as Manfred Leger, president of the management of the DB Project Stuttgart - Ulm GmbH. Congratulations to everyone involved and Glück Auf! Our department ground engineering recently got the order for the construction of a construction pit near the central railway station in Berlin for the upcoming building "The Cube" (www.cube-berlin.de). All the best to our team, we wish for a successful start and an acident free completion of the gallery! We managed to make it to the finals of the ITA-Awards in Singapur with our Uphill-Excavator as part of the BBMV-JV (Crossrail, Los C510) team. In the finals we had to admit defeat against a project for the olympic games in Brazil 2016. Congratulations to the BBMV-team and Glück Auf! We're glad to announce that BeMo received bronce at the „Green Apple Award for Environmental Best Practice 2016“ as part of the BBMV-JV (Crossrail, Los C510) team. Congratulations to our team on-site for this great award! We recently got the order for the construction of a ~250 m long escape gallery for the existing tunnel Wendelberg near the german-austrian border near Schneizelreuth and Unken. During the past weeks our department civils and industrial construction received two further projects: the logistic centre in Würselen, a turnkey construction that has to be done in a extremly short timespan, but also the creation of a sewing sludge at power plant Knapsacker hill which is run by RWE near Hürth. All the best to our department and everybody involved; we wish for a succesfull start and a accident free completion. As part of the BBMV-J BeMo won a „Green Apple Award for Environmental Best Pratice 2016“. If it's gold, silver or bronce will be seen at the award ceremony on November 11th in London. Best wishes to our team on-site for their award! Although the nomiations alone are a huge honor and recognition of the performance at Crossrail C510 we're in hope to receive at least awards. Best wishes to our team on site and all the best for the award ceremony on December 8th in London! Work at Tunnel Zierenberg continues and is right on progress. Good luck to everybody involved and Glück Auf! On friday 20.05.2016 tunnel Zierenberg got broken through after only seven months of tunnelling. Congratulations to our site team, we wish for a successful start for further works! New Commission "Restoration Tunnel Hasselborn"
Our department structural maintenance just received a new commission regarding restoration-works at tunnel Hasselborn near Frankfurt. We wish our team a successful start in july 2016 and an accident free and effective project. In April BeMo demonstrated its proven knowledge at the WTC (World Tunnel Congress) in San Francisco and at the Construction-Concress in Vienna with speeches and presentations about current projects and activities (Restoration Tunnel Arlberg, Desing of Composite Shell Linings, City Tunnel Karlsruhe). We gladly announce that our newly founded department Civils and Industrial Construction successfully moved into their new facility at Westfalendamm 72, Dortmund, Germany. When using a navigation system we recommend entering Overbeckstraße 1 instead. Our new team all the best and good luck for their start. The berlin senate office for city development and environment assigned the project BAB A100 section 16, lot 6 and 7, to the ARGE Heitkamp Ingenieur- und Kraftwerksbau / BeMo Tunnelling. Good luck to our ground engineering department! We wish for a good start and an accident free execution. Yesterday tunnel Klaus, the last of the four tunnels on the A9, got broken through. 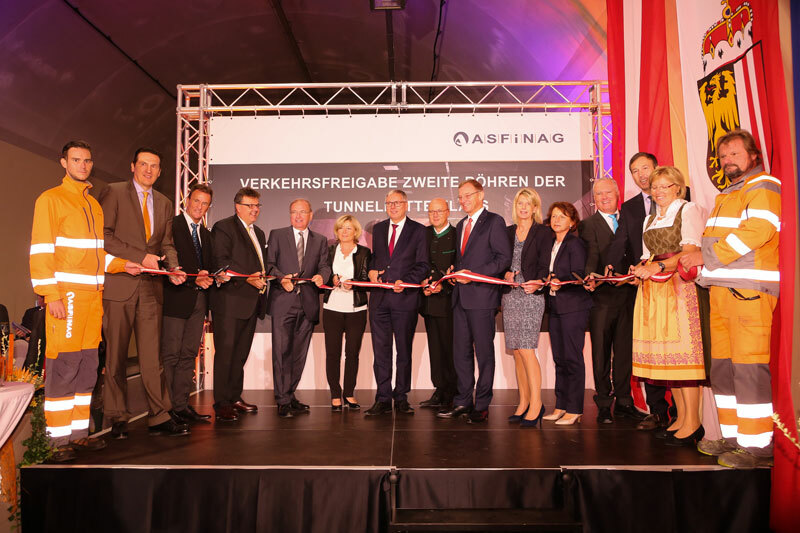 Various involved attended the celebratory, among them minister of transport Gerald Klug, ASFINAG CEO Alois Schedl and ASFINAG managing director Gernot Brandtner. Work in Stuttgart is progressing well, yesterday section 4b got broken through successfully. Thanks and congratulations to everybody involved! This years skiing day took place in Stubai - the weather was just as fine as the snow! More than 1000 viewers took their chance and visited our site at tunnel Zierenberg! As every year we tribute saint Barbara on 4th december at our construction sites. On September 7th the TBM reached their final destination on time after almost 10 months of work. All the best to everybody involved and Glück Auf! Just like in previous years the teams of BeMo Tunnelling participated and succeeded in the annual Company Run Challenge Tirol. Congratulations!